The kids are back in school. The days of sunshine at 8 p.m. are dwindling and the weather is slowly starting to cool down. It can only mean one thing. Summer is almost over and fall is ready to move in. This also means it’s time to close your swimming pool. Cue the sad faces and “boos”. While you may think closing your pool simply means covering it and counting down the days until you can swim again, that’s certainly not the case. There are several steps to follow when closing your pool while always keeping swimming pool safety in mind. Shock the pool several days before you close it. Take out all skimmers, baskets, and any toys or extras that may still be floating in the pool or may still be around it. Clean the pool. This may be the most time-consuming part of the process. You’ll want to scoop up any leaves off the bottom or vacuum it if there is algae on the bottom. If you vacuum the pool, brush it as well. You want to leave the pool as clean as possible. If you can, run the filter a little extra before completely shutting it down for the season. Drain all equipment. All pumps, heaters, filters, and chlorinators need to be completely drained. If you skip this step you run the risk of these items freezing and cracking. Winterize plumbing. If you have an in ground pool, clear all water from the plumbing lines by using a blower to push air from the skimmer, through the equipment and back to the pool. If you don’t do this you could also add swimming pool antifreeze into the line. Be sure to read the instructions on the package before doing this. Add winterizing algaecide and floaters. Walk around the pool as you add this in so that it is evenly distributed. Cover the pool. Once you’ve completed all of these steps, it’s time to actually put the cover on. You want to make sure the cover is as tight as possible and free of any rips or holes. 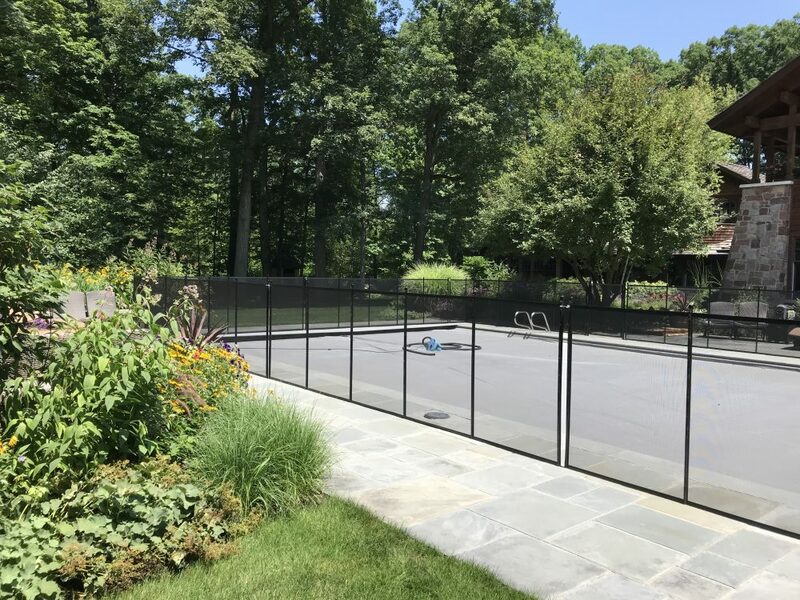 As you close your pool for the fall, it may also be a good time to add a swimming pool safety fence. This will ensure that no one will go in the area because small children can drown if they fall into the pool even when it is covered . Water pools on top of the cover, presenting its own danger. To learn more about swimming pool safety and how a pool fence can help, contact Protect a Child Pool Fence at 1-800-992-2206. Let us show you ways to improve safety around your pool.